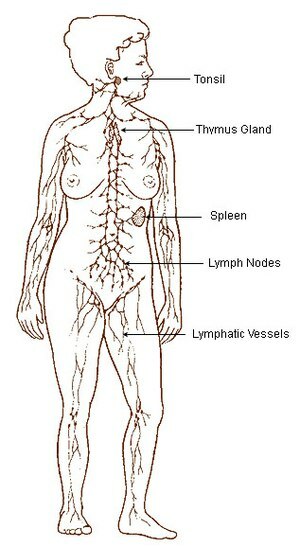 Lymphatic system (Photo credit: Wikipedia) this diagram shows the lymphatic system and will help to show where lymph nodes are removed from and in what direction to massage to move the lymph to other areas… This is a special type of massage and a lymphoedema therapist will show you how. Everyday when you have Lymphoedema there are actions that you must take to keep the Lymphoedema under control…. the same regime is also useful for those who have had lymph nodes removed to protect them from getting Lymphoedema. Avoid any injury to your affected limb. Cuts, scrapes, bites and burns can all bring infection, which can result in lymphedema or in making it worse. Shave with an electric razor, wear gloves when you garden or cook, and use a thimble when you sew. Avoid medical procedures on the affected limb such as blood tests and vaccinations. When ever possible elevate the affected limb above the level of the heart if possible?… Gravity will help. If you have had treatment for cancer and lymph nodes removed and/or radiation the limb becomes vulnerable…After cancer treatment, avoid heavy activity with that limb. Gentle exercise and stretching are encouraged, but avoid strenuous activity until you’ve recovered from surgery or radiation. Try to keep the affected limb as cool as possible (not always easy in hot weather) avoid heat packs, saunas, spas, sunburn and hot baths as these will increase the production of lymph. Try not to wear anything that could constrict your arm or leg, such as tight clothing. In the case of your arms avoid blood pressure readings on affected arm, ask that your blood pressure be taken in your other arm. Make skin care and nail care a high priority. Check the skin on your arm or leg every day, watch for changes or breaks in your skin that could lead to infection. Don’t go barefoot outdoors. Do not allow skin to become dry and cracked. Protect your arm or leg. Treat any cuts, bites or fungal infection immediately … if you are at all concerned re infection see your doctor. Along with this everyday some light exercise will help the lymph to move through the system… Wear a compression garment …. Self massage to stimulate the lymph nodes and the lymphatic system…. Try to eat a good healthy diet…. Try to keep weight to a healthy level so as not to overload the lymphatic system. Plus what ever individuals find that helps. Find a qualified lymphoedema therapist to help with your care. Wow, you have some great information. Sorry it took me so long to get to you. Thanks for all your support too. I received the following and was rather surprised that NICE seems to have no idea that surgery is now available, although not as yet, readily on the NHS. Shall we tell them!!!?? Having visited your site and several otheres there seems to be some choice out there too. Thank you my friend for sending this on to me. NICE am afraid seem a little behind the times when it comes to breast cancer related lymphoedema. My specialist nurses have been advocating specific exercises to me for the last 15 years. There is even a dvd on how to do it!! They also say it is “incurable” and up until 2 years ago I would have agreed with them as that’s what the NHS has been telling us. Yet French surgeons have been avoiding it happening for 20 years. A year ago I met a surgeon called Ms Anne Dancey at the BMI Hospital in Birmingham who transfers some lymph glands from the groin and implants them into the affected armpit. It’s very expensive as it is only available privately at the moment. Although this doesn’t actually cure the lymphoedema, the results she is having are tremendous. However, this is bolting the stable door, so I am currently running an e-petition in the hope that an earlier intervention will stop or reduce lymphoedema in it’s tracks. Please see below. If we can prevent this life changing and very unpleasant condition, then every effort should be made to do so. It HAS to be cost effective to the NHS in the longer term. This can do nothing but good for our next generation. The surgery will save time and money, both for the sufferer and the NHS. Each day it takes a minimum of 45 minutes to do the physiotherapy and skin care. Then wriggling into the sleeve and glove can take a quite a few minutes too. By eliminating all the follow up services too such as measuring, use of lymph assist machines and lasering, plus lessons in lymphatic control and the provision of sleeves and gloves, not to mention the training of specialist nurses. Reducing this will save the NHS money, so we will have happier cancer sufferers and at a lower cost, what’s not to like about that? Thanks in anticipation for your support. PS Thanks again Carol,I have some material and photos I can email to you if you want them. The National Institute for Health and Care Excellence (NICE) has published draft recommendations to provide clarity on the link between exercise and breast cancer-related lymphoedema. This is a painful and incurable condition that causes chronic swelling of the arm or nearby areas. It is likely that each year in the UK, nearly 10,000 people with breast cancer will go on to develop lymphoedema in the arm following treatment[i]. NICE is currently updating its guidance on the diagnosis and treatment for people with advanced breast cancer following new evidence on the safety and benefit of exercise for breast cancer-related lymphoedema. NICE has developed two new draft recommendations, which have been published for consultation, to directly address this issue. Professor Mark Baker, Director of the NICE Centre for Clinical Practice, said: “Lymphoedema is a long-term condition which occurs when the body’s lymphatic system becomes damaged and is unable to drain fluid in the normal way. For breast cancer patients, lymphoedema may occur as a result of treatment – such as surgery or radiotherapy – or cancer cells blocking the lymph system. This results in swelling that is often painful and makes joints stiff and difficult to move. These new recommendations have been developed as part of NICE’s new clinical guideline update process. This method aims to produce small and specific updates to NICE guidance more quickly than the standard clinical guideline process, if new evidence arises in very precise areas of healthcare. [i] About 50,000 women and 400 men are diagnosed with breast cancer each year in the UK. According to Cancer Research UK, 1 in 5 people who have been treated for breast cancer will go on to develop lymphedema in the arm. The draft recommendations, which will update the NICE guideline on advanced breast cancer, will be available at http://www.nice.org.uk/guidance/index.jsp?action=byID&o=14343 from Wednesday 12 March 2014. Once published, the proposed recommendations for people with breast cancer-related lymphedema will update NICE’s current advanced breast cancer guideline. However, all other recommendations will remain the same. To find out more about what we do, visit our website: http://www.nice.org.uk and follow us on Twitter: @NICEComms. Thanks Hillary I will create a post out of this to share plus share on my FB page … You had the LNT??? And is it going well?? See if we can get some signatures.. The more we build awareness of Lymphoedema the more likely we get support for new treatments not the same old same old!!! These people do not live with it! !